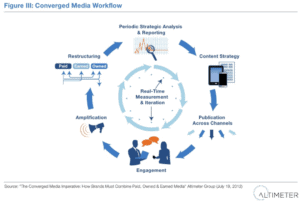 The Converged Media Imperative: How Brands Must CombinePaid, Owned, and Earned Media By Rebecca Lieb & Jeremiah Owyang With Jessica Groopman & Chris Silva Includes input from 34 ecosystem contributors. Consumers rarely pause to note provenance. Media are a veritable blur. The primary quest is for information, entertainment, or shopping. The goal is simply to ?nd the “right” media, be it paid, owned or earned, along this highly dynamic customer journey. Thanks for the provided content. I’ve barely gotten through the first couple of pages but the read is invaluable in regards to social media.